Produced by Ask Noah International, published under the auspices of Sichos in English. Compiled and translated by Rabbi Yehoishophot Oliver. 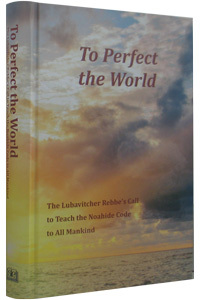 Editor: Dr. Michael Schulman, Ph.D.
As a foremost global spiritual leader, the Lubavitcher Rebbe, Rabbi Menachem M. Schneerson, emphasized that G-d commanded the Jewish people, through Moses at Mount Sinai, to influence the people of the world to observe the Torah’s Seven Noahide Commandments. This mandate was transmitted through the generations and codified by Maimonides (Rambam). Despite the key importance of this mission, Jews were unable to fulfill it during most of their difficult history. What is the basis in Torah for this outreach? What is the pious faith for Gentiles in G-d’s eyes, and what parts of Torah should they learn? Who should be involved in this outreach? This book presents a systematic compilation of the Rebbe’s many teachings and directives for Jews, and Gentiles as well, about how to widely promote belief in G-d, observance of the Noahide Code, and acts of goodness and kindness. Books are in stock and ready to ship.